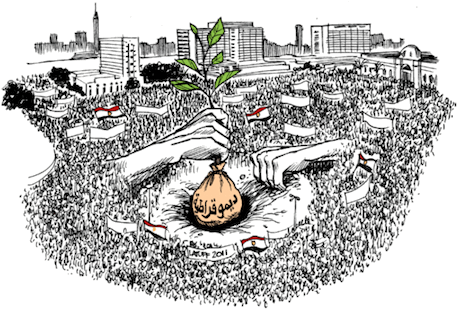 Seeds of democracy in Tahrir Square. Carlos Latuff. All rights reserved. The question of democracy is probably the main concern of those preoccupied with Egyptian affairs. Since the January 25 revolution, Egyptians have been searching for a real democratic movement that can lead post-revolutionary Egypt and resolve its crises, especially the crisis of modernization. Egypt lacks the spirit of true modernization; the institution of a strong state (in the structural, not oppressive, sense) that is impartial to religions, races, and which can provide a safe space for political and social freedoms as well as rights for its citizens. But many Egyptians believe this goal is unattainable and have become nostalgic, recalling what they believe to be a past where democratic forces were predominant in Egypt - especially after the 1919 revolution which was the largest democratic movement in Egyptian history. This article srgues nstead that a democratic force in Egyptian politics, which no doubt existed, has only been marginal and contingent upon circumstances which, in turn, resulted in it ending quickly. Since then, attempts at restoring this democratic force have been nothing short of desperate. But it is unlikey that a strong democratic political force will surface in Egypt until our misconceptions about the past have been resolved. The Urabi Revolution attempted to integrate and strengthen the Egyptian presence - especially that of upper and middle class landlords - in the military and government. As such, some Marxist analysts, such as Tahir Abdul-Majeed and Salah Issa, consider the Urabi revolution Eguypt's first bourgeois revolution. During the period after the defeat of Urabi many newspapers and magazines emerged. As the Egyptian History newspaper records: "In 1898, 169 newspaper and magazines were being published in Egypt, and the number rose to 282 in 1913. Of these, the regular ones were al-Muqattam, al-Ahram, al-Liwaa, al-Muayyad, al-Watan, and al-Jaridah, and they expressed political opinion and intellectual works of high value." Thereafter, many parties with varying political orientations, some of them supporting the Khedive and the British occupation, such as the Reform Party, the Liberal Constitutionalists Party, saw the light of day. Others looked to end British occupation in Egypt, such as the Nationalist Party and Liberals Party. Al-Umma and the Nationalist Party. These are of particular interest as they were considered by many to have been leaders of the democratic movement in their time. Al-Umma Party emerged on September 20, 1907 under the leadership of Hussein Pasha Abdul-Razik, who turned his newspaper into a political party: the Umma Party. The party’s ideology was based on the ​​normalization of British occupation and acceptance of official government positions under its authority, as Egyptians were viewed as unqualified for independence because independence could only materialize with education and improved levels of national consciousness. Theoretically, the party believed that independence meant independence from the British and Ottomans, which at the time was somewhat progressive. Hussein Pasha Abdul-Razik made sure that wealthy, dignitaries, Shura members and Christians were the majority in the party. He appointed Ahmad Lutfi al-Sayyid as the party's secretary general. The party was not fundamentally political and never called for independence from the occupation; it was interested instead in the 'raising" of a nation "not eligible for independence", and recruiting as many wealthy members as it could. Therefore, al-Umma Party was considered the party of big landowners, expressing their financial interests, which in most periods did not see too much harm in the continuation of the occupation. On the contrary, it often considered the British presence a form of protection from the Nationalist Party. First: The full independence of Egypt, including Sudan and all its lands. An independence that is complete, unblemished by any mandates, guardianship, foreign intervention or any limitations. Second: The founding of a constitutional government, where sovereignty is to the nation, and where the governing body is accountable to a parliament with full powers. Third: The respect for international treaties and financial agreements signed by the Egyptian government for the purposes of repaying debt in a way that does not undermine the sovereignty of the country. Fourth: The open condemnation of harmful acts and praise and encouragement of beneficial ones. Fifth: An endeavor to improve health and advance social conditions. Sixth: Improve access to education across the entire country, on the basis of true nationalism so that the poor have their share. The establishment of labor institutes, and the opening night schools for laborers and workers. Seventh: Upgrading agriculture, industry, commerce, and all domains of life. Eighth: The open condemnation of harmful acts, acknowledging and encouraging beneficial ones and guiding the government to the good of the nation, its wishes and reforms it requires. Ninth: The preservation of good relations between Egyptians and foreigners. Tenth: Strengthening mutual trust and the friendly relations between Egypt and other countries. Despite the diversity of these principles and their clearly democratic and modern nature, the Nationalist Party wanted to be the only legitimate representative of the nation, clearly refelcting an authoritarian tendency that excluded other political parties from participating in national efforts to solve the problem of occupation. Moreover, the concept of independence the party had only related to British occupation, not Ottoman, in order to preserve - if only formally - Islamic unity. This posed a contradiction to the establishment of a nationalist constitutional system. As such, the Nationalist Party had very strong internal contradictions that were to give rise to many authoritarian parties that arose from that stable, such as the Young Egypt Party and the Muslim Brotherhood. Nationalist Party ideas continued to take several forms until they materialized in the Free Officers movement which ended the rule of Muhammad Ali’s family as well as the democratic movement - a very brief movement. Everyone knows the role of the Wafd Party and the role Saad Zaghloul played in leading the revolution against the British occupation. But the Wafd Party also had internal contradictions. Historically,it is considered the most democratic and secular party in Egypt, but, at the same time, despite its initial leadership of the revolution, it did not continue to play a revolutionary role against the occupation for long. With time, the vision of its reformist wing conflicted with the party's platform, which undermined the party's role. Numerous defectors founded the Liberal Constitutionalists, al-Saadis parties, as well as many others. The historic founders of the Wafd Party, included Saad Zaghloul, Mustafa al-Nahhas, Ahmad Lutfi al-Sayyid, Makram Ebeid, Boutros Ghali, and Mohammed Mahmoud. They were all part of the landowner and intellectual classes, far removed from social and popular demands. With time, the Wafd Party could not maintain its strong position, and failed in providing solutions to the British occupation. The party then adopted a reformist agenda, which also diminished it since it was unable to provide social solutions. Changes in government became both frequent and ongoing. With the dissolution of the Wafd Party came the end of a real democratic movement in Egypt. The end of the democratic movement does not mean the absence of democratic figures. Egyptian history, after the 1952 coup, is full of figures who believe in real democracy, but continue to work either as individuals or through very small organizations. There is no doubt that after the January 25 revolution, the question of democracy and the relationship of the state to the people has been reopened, with the main concern being the establishment of a democratic movement. Since the 2011 revolution Egypt has emerging democratic experiments and we are yet to see their potential. Civil society organizations working on human rights, feminist issues, and small parties like the Bread and Freedom Party, the Egyptian Democratic Party, the Constitution Party, as well as some art and culture youth initiatives form a nucleus of a truly democratic movement. But this nucleus is under a lot of pressure. So the question is, will it survive?